How is a new grip, new putter or a focus on “your stroke” going to help you putt from 30 feet, down a fast, slopped-green to the hole? How is a new grip, new putter or a focus on “your stroke” going to stop you from “looking up” and decelerating the putter-head on a short pressurized 5-foot putt? The new grip, putter or focus on the “stroke” have nothing to do with you getting the ball close or in the hole from distance, nor can they stop you from decelerating through the ball and missing a short-putt. Predominately we must switch of the conscious “must-do-this” controlling part of the brain and let our natural, creative flow of the subconscious brain take over. The subconscious processes 40 million bits of information per second versus the “40″ of the conscious… yep, 40 v 40 000 000! “Free-throwing in basketball” is a closed-skill just like putting (requires a quite, conscious mind so the subconscious can take over). 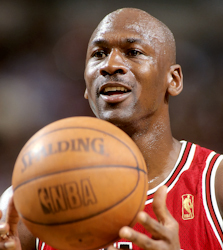 When Michael Jordan was making all those basket’s, he was not trying to “look pretty” or make his wrists and elbows hinge perfectly, he was focused on… chewing gum! Yep, that’s what he told to a reporter when questioned about what he thought about when he was throwing free-throws when the pressure was on. Why? Because he had practiced this simple action (and it is; the same as a putt – is simple) millions of times. He knew by taking his “controlling-mind out of action” and relaxing his body, it would give himself the best possible chance of making-the-throw. Following a repeatable putting system on every hole (that you know and trust) will make you a good – or even a great putter – regardless of your handicap (as long as you put in a little effort into learning, testing and refining the process). Responding to the outcome thoughtfully. This is what the best putters in the World do. Copy them. Gary Player basically says your stroke, style of stance doesn’t matter; great putters have used different and not so “perfect-strokes and techniques” (think Nicklaus, Woods, Crenshaw, Bobby Locke; all totally different set-ups, strokes and used very different putters). But what is VITAL is that you are focused on Speed and Feel – like all the great putters have been preoccupied with – not technique or equipment. Ernie talks about how he had been struggling with his putting because his ROUTINE had changed. And most importantly the time from between his last look at the hole and when he pulled the trigger had got longer. It is vital to look and react. Note that Ernie has turned his putting from diabolical (recent years) to good enough to win the 2012 British Open. He did this on the back of working with a “visualization coach.” Fancy that! Because the putting-stroke is an extremely simple action, anyone – regardless of your handicap – can putt very well given the right keys to focus on. If you want to go deeper right away head over to: The Truth About Putting. If you want an overview sign up for free to The Great-Leap-Forwards-In-Putting here. What are you common mistakes; 3-putts – not getting long putts close; missing too many short putts? Let me know in the comments below and I will see if I can help you out. 6 Responses to Focus on the right things to putt well – really well! your articles seem very encouraging.would like to read in details your putting and short game articles. Glad you are liking the articles – there will be more coming every week. I have include some links at the end of the post if you want to learn more right now. That’s great to hear that the putting tips have helped you out. I will keep them coming! The biggest obstacle in my putting is loss of confidence. I put the ball’s line straight toward the target line, but when I address the ball to putt, the ball’s line was directed seemingly toward the left of target. Sometimes I try to putt between the ball’s line and recognized target line. Yes this is the problem with lining up the line or logo on the ball. When you set up to the ball you want NO DOUBT to where you are aiming. You want to walk up get set up over the ball and putt straight away, there is no time to be looking at the line and even worse second guessing the aim. I stopped lining the logo/line 16-17 years ago. Second guessing or consciously aiming ruins R number 2 – Routine. The aim of the routine is to give you a repeatable process that does NOT require thinking. Aiming and second guessing is thinking… not something you should be doing when you are over the ball. Try putting without lining up the logo Doolin.